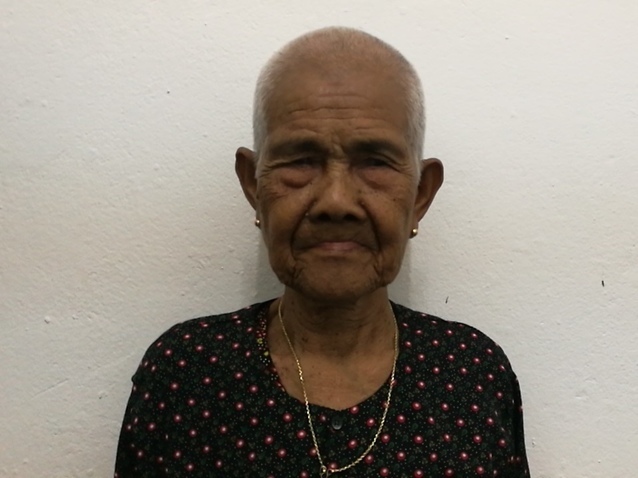 Nheib is a woman from Cambodia who needs $398 to fund cataract surgery. Nheib is a 77-year-old rice farmer from Cambodia. She has twelve grandchildren and enjoys watching television and listening to the monks pray in her spare time. Two years ago, Nheib developed a cataract in each eye, causing her tearing, irritation, and cloudy vision. She has difficulty seeing things clearly, recognizing faces, and going anywhere outside. When Nheib learned about our medical partner, Children’s Surgical Centre, she traveled for three and a half hours seeking treatment. On March 14, doctors will perform a small incision cataract surgery and an intraocular lens implant in each eye. After recovery, she will be able to see clearly. Now, she needs help to fund this $398 procedure. Nheib's case was submitted by Lindsay Bownik at Children's Surgical Centre in Cambodia. Nheib was submitted by Lindsay Bownik, Stakeholder Relations Officer at Children's Surgical Centre, our medical partner in Cambodia. 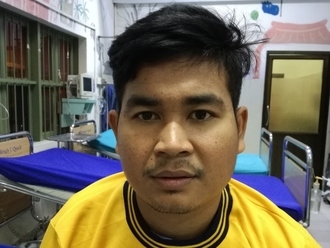 Nheib received treatment at Kien Khleang National Rehabilitation Centre. Medical partners often provide care to patients accepted by Watsi before those patients are fully funded, operating under the guarantee that the cost of care will be paid for by donors. Nheib's profile was published to start raising funds. Awaiting Nheib's treatment update from Children's Surgical Centre. Nheib is currently raising funds for her treatment. Monicah is a baby from Kenya. She is the only child to her young mother. Monicah has been diagnosed with hydrocephalus, a condition in which excess cerebrospinal fluid accumulates in the brain and increases intracranial pressure. As a result of her condition, Monicah has been experiencing an increasing head circumference. Without treatment, Monicah will experience severe physical and developmental delays. Our medical partner, African Mission Healthcare Foundation, is requesting $685 to cover the cost of surgery for Monicah that will treat her hydrocephalus. The procedure is scheduled to take place on April 17 and will drain the excess fluid from Monicah's brain. This will reduce intracranial pressure and greatly improve her quality of life. With proper treatment, Monicah will hopefully develop into a strong, healthy young girl. “We had lost hope of getting treatment for our daughter and we pray that our hopes will be revived here,” says Monicah’s mother. Sophat is a 26-year-old meat seller from Cambodia. He likes to play soccer, read books, watch television, and listen to the radio in his free time. Four months ago, Sophat was in a traffic accident, injuring his shoulder. He has been diagnosed with a brachial plexus injury on his right side. The brachial plexus is a nerve network that transmits signals from the spine to the shoulder, arm, and hand. Injuries to this nerve network can result in loss of function and sensation. He is able to move his arm and cannot work or easily take care of himself. Sophat traveled to our medical partner's care center to receive treatment. On February 15, he will undergo a brachial plexus repair surgery. After recovery, he will be able to regain movement in his right arm. Our medical partner, Children's Surgical Centre, is requesting $637 to fund this procedure. He says, "After surgery, I hope that I no longer have any pain and will be able to go back to work."